Canberra correspondent John Passant finds himself on the wrong side of Facebook's "community standards". Last week, Facebook banned me for 24 hours for a breach of their "community standards". Why? I wrote on a post that 'Hitler was popular too'. To put this into context, it was in answer to a Nine Media post of an article from their newsprint arm (formerly Fairfax) on the potential fascist threat that Senator Fraser "final solution" Anning poses. 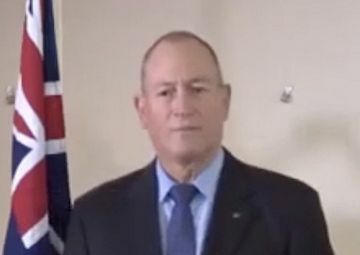 Tony Walker’s article, 'Let's hope Fraser Anning soon returns to the obscurity he deserves’, prompted a lot of comments — many of them very supportive of the Senator. You know the drill, He just says what many of us think — that sort of thing. There were calls for Anning to be prime minister. So, despite this freewheeling with fascism, why is Anning popular in some circles? A number of commenters on the Fairfax site defended Anning by saying he was only reflecting the thoughts of many Australians and that explained why he was popular, so I commented that Hitler was popular too. It is true that the Nazis won 37% of the vote in the July 1933 Election in Germany and the Nazi Party was the largest party, although not then in government. In the November election, they won 33% of the vote. The result was the formation of Hitler’s Government on 30 January 1933. I do not think that, as the Anning article makes clear. To mischaracterise libertarians, neoliberals, conservatives and reactionaries as Nazis undermines the campaign against the real fascists. Perhaps my statement of truth prompted Anning supporters to report me to Facebook. But how could Facebook conclude that a factually correct statement, made to rebut Anning supporters, was against community standards? It may be that Facebook is soft on fascists. Another possibility is that Facebook does not understand that fascists organise around "othering" — for example, of immigrants. A third is that if enough people report a comment, Facebook suspends, as a matter of course, the person who posted. Stating the truth about the potential for the rise of fascism is not against community standards. Indeed, the article I was commenting on makes the same point. My comment that Hitler was popular too, was factually correct. The fact that it upset neo-Nazis in Australia and they reported my comment is not a reason for you to side with these fascists and wannabe fascists. As a member for Independent Australia of the Press Gallery in Australia's Parliament in Canberra, I may write about your political and pro-fascist censorship at the behest of wannabe Nazi and make complaints to the Federal Human Rights Commission and my Territory Human Rights Commission. My anger is only compounded by the fact that every time I have tried to send this during the ban, you tell me you cannot process it at the moment. Every time I hit the submit button, Facebook told me that the service was currently down and to try later. Banning me for 24 hours also has the potential to cut my earnings since F,acebook is a major way non-mainstream media, like Independent Australia, spreads its message. It is not just governments or private businesses that undermine free speech. There is, for example, a vast army of people who blame the current societal problems on "the other" — the other being people like asylum seekers and refugees, or immigrants, or Indigenous Australians, or Muslims. When the great uniformity of their ideas is challenged, they go into overdrive to shut down dissident views. The treatment of Channel Nine reporter Brooke Boney is an example. Brooke is a Gamilaroi woman. The "thought uniformists" responded, both in the media and online. The Daily Mail, for example, called it called it 'an astonishing Australia Day rant'. Failed Labor leader and wannabe One Nation NSW Legislative Council member Mark Latham described Boney’s comments as "victimology" and "absurd". Even worse were the responses from a large number of ordinary Australians, many of whom have been force fed and accepting of commercial TV propaganda for years. The backlash included hate speech and racism. The aim of those who want everyone to bow before the flag – dressed according to Scott Morrison’s uniform standards – and stand when the band plays 'God Save the Queen', or 'Advance Australia Fair' or whatever, is to shut the rest of us up. They want to marginalise those who disagree with the deeply ingrained racism and xenophobia in Australia, let alone raise questions about the nature of society. In part, this is explicable by the failure of the radical left to connect with working people in a meaningful way and the constant xenophobia, racism and other calumnies from the Government, including their concentration camps on Manus Island and Nauru. That is why non-mainstream media like Independent Australia is important. It helps keep alive the voice of dissent.